THE AMENDMENT features Mike Vogel (NBC’s “The Brave,” The Help, The Case for Christ) and Taryn Manning (“Hawaii Five-O,” “Orange Is the New Black”). And in his film debut, Brooks Douglass pays tribute to his father by playing him in the movie. NOTE to viewers: The crime scene is told gracefully, but is not appropriate for children. Richard Douglass was a beloved pastor and his wife Marilyn, a talented singer and loving mother. Richard pastored his first church when he was 16 years old and continued this passion and purpose until his death at age 43. In his lifetime, he was a missionary with his family in Brazil from 1968 to 1972 then head pastor at Putnam City Baptist Church in Oklahoma City. He also authored hundreds of faith-based articles and the book My Way, God’s Way (1978), and was dedicated to prison ministries throughout Oklahoma. People still talk about Marilyn’s beautiful singing voice and say she could fill the sanctuary and their hearts as she sang. Their children, Brooks and Leslie, were only 16 and 12 years old when two drifters knocked on the door of their rural Oklahoma home. What started as a robbery escalated to a senseless and devastating crime. Since then, Brooks has dedicated much of his adult life to raising awareness and passing legislation to protect and serve crime victims and their families. He was elected to the Oklahoma State Senate for three consecutive terms (1990 – 2002) and served in the military. As a crime victim himself, lawyer, state senator, and now film maker, Brooks is a unique and powerful voice for victims. He is the recipient of the Ronald Wilson Reagan Award for Innovations in Public Policy (awarded by the U.S. Department of Justice, 2011), the Lisa Hullinger Memorial Award (from the National Parents of Murdered Children, 2013), the Shining Star Award (from Prison Fellowship, 2013), and numerous other recognitions for his work on victims’ rights legislation. Leslie Douglass is a dedicated educator, mother, and now grandmother. Leslie worked directly with Taryn Manning (the actress who played Leslie in the movie) to help prepare her for the role and is featured in the movie singing “Shenandoah” in the restaurant scene. Her son, Zach Coffey, is also a talented singer and is heard singing “Homework” over the scene of Brooks playing football with his father. 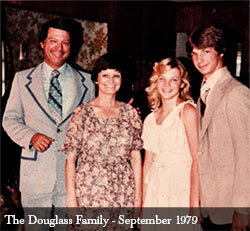 To honor his parents and to continue their legacy of helping others, Brooks and his wife Julea have created the DOUGLASS HOUSE , an online resource to help crime victims and their families connect with important and necessary resources. 100% of donations to the DOUGLASS HOUSE go to effective and established 501(c)3 organizations providing services that support victims’ rights, recovery, and restoration. 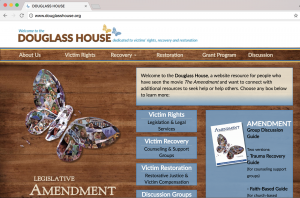 Julea and Brooks have also co-written two discussion guides – Amendment Trauma Recovery Guide and Amendment Faith-based Guide – to go with the movie that are free to victim support groups. Why is the movie called “The Amendment”? The movie was originally called “Heaven’s Rain” but renamed “The Amendment” for the many important words and meanings within that word—to amend, to mend, to make better, improve, and heal; to make amends—and ultimately to influence legislative amendments to serve and protect victims of crime. Our sincerest appreciation to Dunham+Company for helping guide us to the name The Amendment. After nearly 10 years in the making, THE AMENDMENT is now available on iTunes, Amazon, DVD, and other streaming options. Finally, a VOICE for VICTIMS in mainstream media.